Our mission is to impact the lives of institutionalized and impoverished children in Bulgaria by compassionately meeting their basic needs. Shoe project. 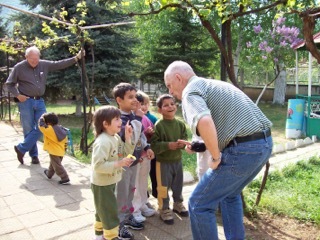 BCI has provided thousands of new shoes and socks to tens of thousands of children in orphan homes across Bulgaria. Learning Center Borovtsi is a short-term residential program for at-risk young men. Most of them come out of the orphanage system. A few are from homes in extremely poor Roma communities. Healthy Child Project. Sponsored by the Dutch Foundation “Come Over and Help,” this project provides vaccines, vitamins, and over-the counter common medications to children in 5 homes. Since its inception, this program has administered more than 6,000 vaccines. Education/training for education majors in universities, orphanage workers, parents of special needs kids. These include seminars, on-site practical application, and even provision of equipment and other resources. Provision of funds/materials/work for remodeling or repairing of orphanage buildings and playgrounds. 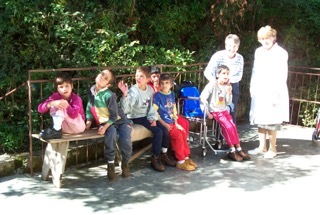 Provision of wheelchairs and other equipment for special needs children. 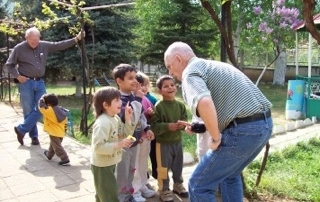 Provision of funding for staff positions at several orphan homes across Bulgaria. 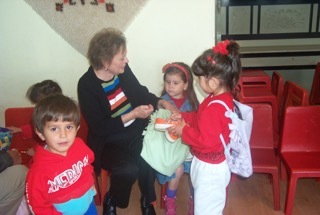 Volunteer teams provide weeks of activities: stories, music, art/crafts, out-door games, etc., to brighten the days of institutionalized children. None of these projects would be possible without the support of businesses, organizations, individuals and volunteers— people just like you! Click here to see how you can help. It takes a lot of help from churches, businesses, organizations and people just like you. Here is a quick look at some of the things we’ve done, and below are stories from those who have helped us do it. Children from one of the homes, displaying their new shoes! One of our teams serving at a home for deaf children. Team member Faith, presenting some of the kids with new backpacks (made by kids at one of our partner churches, The Heights, in Dallas, TX). Team member Jeff has made a new friend! Everyone who has come to help us, leaves changed. Every experience is different, but they all share a similar theme–lives forever changed by the power of the love of Christ being put into action.